Uncompromising woodworking clamps and why you need them. Ever start a home improvement project and halfway through realize that you need an extra pair of hands to get the job done? For many of the DIY woodworking projects we tackle at home, there really is a simple answer – clamps. 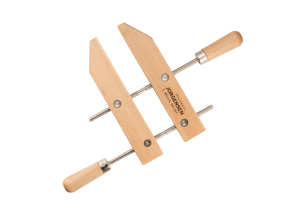 Pony Jorgensen has been making quality clamps for every type of woodworking project since 1903. That’s 113 years of quality, strength, tradition, and technique going into every clamp we build. Beyond that, there’s a clamp for almost any need. Keep on reading to learn about these quality woodworking clamps and why you need them for your own projects. 1. Pipe clamps: Long lasting, perfect for plumbing. 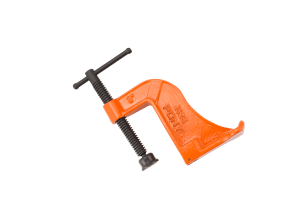 The pipe clamp shares many of the same uses in woodworking and carpentry as other more well-known clamps, but pipe clamps can also be used for plumbing jobs. Many plumbing jobs require overhead work and awkward positions to reach hidden pipes or fittings. Whether reaching up to pipes in a basement or crawl space, or trying to work behind a sink or toilet, pipe clamps are perfect for providing support. 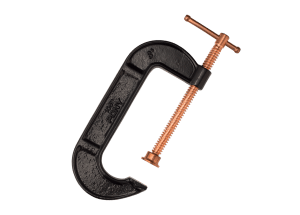 Whether at home or at the construction site, the Pony pipe clamp fixtures for 1/2-inch black pipe is one of the most popular pipe clamps available today. Simply fix the clamp to a wall or ceiling to firmly secure the area you’re working on. What’s more, the cast iron Pony pipe clamp fixture for ½-inch black pipe can be used to plug leaky pipes. Now, that’s not to say these can be used for fixing pipes that are gushing water or that have a gas leak – those pipes would need to be fully replaced. But when it comes to a small leak that could use a temporary fix, simply attach the pipe clamp to the leaky area and no more leak. 2. Bar clamps: Lightweight, vital to cabinet-making and edge-gluing projects. Perfect for the do-it-yourselfer tackling a woodworking project, or the seasoned carpenter, a bar clamp is basically a frame consisting of a long bar with two adjustable clamping jaws. Light weight but with an excellent strength-to-weight ratio, bar clamps can be used for projects that require lots of gluing, like joinery and cabinet making. When it comes to woodworking clamps, the bar clamp is typically the preferred choice. Let’s face it, when we’re working with clamps, we want to be able to lift and move them into place without feeling like we’re resistance training. And when it comes to strength-to-weight ratio, there really isn’t another aluminum bar clamp on the market that delivers like this one. 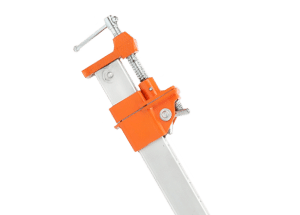 Perfect for edge gluing, this durable, rust-resistant aluminum bar clamp isn’t just reserved as a woodworking clamp, it can also be used in metal work. If you’re looking to weld two pieces into one for example, the bar clamp can be used to hold the pieces together while the weld is being created. Protecting your materials while working with clamps can present a challenge. You want to make sure that the clamp is tight enough to secure your materials but not tight enough to cause any damage. This is most important when working with woodworking clamps. Pony Jorgensen’s work-protecting bar clamp pads provide an easy solution to this common problem. 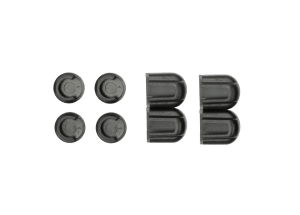 These clamp pads eliminate the need for wood blocks to protect your materials, and they are made from a soft, durable plastic padding with a non-stick/non-slip protective cushion. 3. Specialty Clamps: Unique, durable and specialized. One of the most frustrating situations for DIYers is not having the right tool for the project. And this is even true when it comes to high-quality woodworking clamps – sometimes a common clamp just won’t get the job done. These unique working conditions call for specialty clamps. Whether you’re repairing molding or trim or you need to secure your materials to a workbench, Pony Jorgensen has you covered. Every Pony specialty clamp is made with the same care and craftsmanship that goes into making every traditional clamp with the same result: a quality, durable, long-lasting product. When a traditional clamp won’t give you the coverage you need over broad areas, the classic Jorgensen adjustable handscrew is the answer. Easily applied and removed, the seasoned hardwood handles are designed for comfort. Crafted to maximize strength and durability, this woodworking clamp is perfect for holding oddly shaped materials together and the seasoned-straight grain hard maple wood jaws protect against marring of finished surfaces. This woodworking clamp’s added benefit of protecting your materials is why many carpenters choose the adjustable handscrew as their go-to clamp for their building projects. The workbench is a sanctuary for many do-it-yourselfers and when you need to secure your materials to your workbench or machine table, the Pony hold-down clamp provides all of the flexibility needed to get the job done. Designed to rotate a full 360 degrees around the holding bolt, the Pony hold-down clamp can be used on any wood or metal surface. This heavy-duty woodworking clamp also has a unique square-head screw that can be tightened or loosened with a wrench. 4. C-Clamps: Versatile, everyday use. If there is one clamp that should be a mainstay in every garage or workshop, it’s the tried and true C-Clamp. From woodworking and carpentry to heavy-duty commercial applications, the c-clamp is one of the most versatile clamps available today. Some basic uses of the c-clamp include holding two pieces of wood or metal together while work is completed or securing materials together while glue dries. And based on the size of the job, there’s a variety of small and large c-clamps available to meet any need. By far, the most universally used, general purpose woodworking clamp available is the Pony carriage C-clamp. Built for almost any task, these cast iron clamps are perfect for regular duty or industrial service. 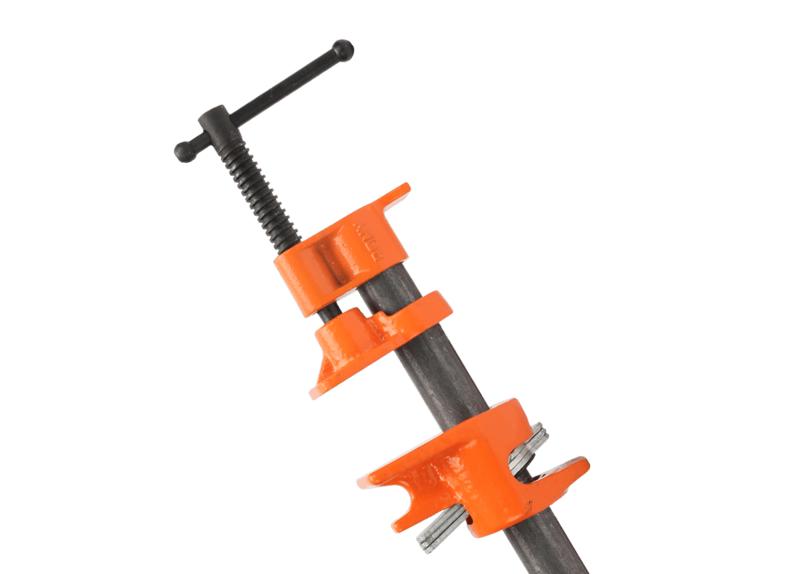 Built for maximum strength, this woodworking clamp is ribbed to avoid side strain. And, beyond the everyday uses of c-clamps, there’s even a trend in design where c-clamps are used as bookends in a bookcase to capture an industrial vibe. Some might call the Classic Pony light-duty C-clamp “the perfect clamp.” Probably the best clamp for use in a workshop or garage, the threaded steel screw is zinc plated with a black finish for maximum durability. The Classic Pony light-duty C-clamp is available in a variety of sizes and is perfect for many at home projects. 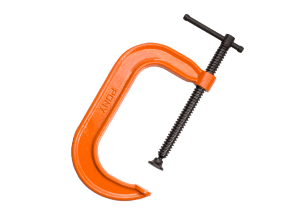 Beyond the obvious uses in woodworking and carpentry, other creative uses for this orange clamp include securing a tablecloth to a table on a windy day, or clamping down the top of a garbage can to the base when there are hungry raccoons around.